‘THERE are no words to say how thankful I am of the community around Portsmouth – you’ve helped to save my husband’s life’. These are the emotional words of the wife of a veteran soldier as her husband was last night found safe and well after an army of volunteers rallied to rescue him. Robert Ballantyne disappeared on Sunday morning and had not been seen for 36 hours when he was eventually found in woodland north of Havant. The 37-year-old, who previously served with the former Royal Highland Fusiliers and is a Kosovo War veteran, handed himself to police as the search teams closed in on his position. Now his relieved wife Kirsty Ballantyne has paid tribute to all those involved in the search for the father-of-two. ‘What they have done has been phenomenal, I can’t put it into words just how thankful I am,’ said the 37-year-old. ‘They have saved my husband’s life. 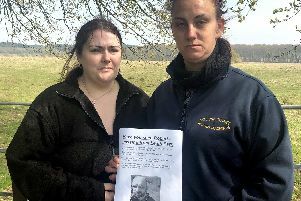 Mr Ballantyne vanished at about 7.30am on Sunday, telling his two young children he was ‘going out to walk the dogs’. However, his wife became worried when she saw the family pets were still at home and immediately called the police, fearing for her husband’s safety. Within hours an army of volunteers had been mobilised to join teams from Hampshire Constabulary and Hampshire Search and Rescue. The bulk of the volunteer search force was led by Portsmouth-based armed forces group All Call Signs, which specialises in hunting for at-risk missing veterans. Dan Arnold, co-founder of the group, spearheaded the rallying cry and yesterday co-ordinated a major search operation north of Leigh Park. Involving more than 50 people – made up of current and veteran soldiers, former Royal Navy sailors and RAF personnel, off-duty police, civilians and drone operators – teams scoured the area for five hours until Mr Ballantyne was found. Speaking of the success, retired Lance Corporal Mr Arnold said: ‘I cried when I heard he had been found. It was a huge relief. ‘This is a feather in the cap of Portsmouth. Every person was absolutely dedicated to putting their lives on hold to help this guy. ‘We had guys from Andover come down, and 10 from the base on Thorney Island. It was amazing. Mrs Ballantyne was full of praise for All Call Signs and the team of armed forces personnel that came to her husband’s aid. All Call Signs was set up in the wake of the death of Bognor-based special forces veteran Danny Johnston, who took his own life in May last year. Last week, a coroner demanded the Ministry of Defence put in more effort to support soldiers battling mental health issues. Mrs Ballantyne now wants to see Hampshire police co-ordinating with organisations like All Call Signs whenever a current-serving soldier or veteran vanishes.